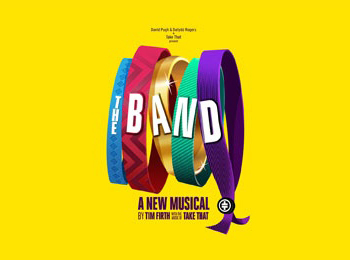 This is a brand new Musical in Manchester for its World Premier performances before embarking on a long tour. The Band of the title is one of the most successful bands of all time, and a band which started out in Manchester as a boy-band with five young and talented lads under the title of Take That. Fitting then, that the Musical should premier in their home city. However, you would be wrong to think that this Musical is just another Tribute or Jukebox show, it isn't that at all; and although it will undoubtedly appeal to Take That fans primarily, this is a fully-formed and well thought-out Musical with a proper and real storyline, and the music seemed somehow incidental. You can probably tell I was rather sceptical at first, but the 'girlie' part in me (yes - EVERYONE has a girlie side!) was loving every minute of it. Playing Take That on stage for this Musical is a group of five young lads who, I would argue, are no less talented than their mentors and idols themselves. They are the winners of the BBC TV series Let It Shine and they are collectively known as Five To Five. They don't actually get to sing any one song in its entirely throughout the whole show, and actually aren't even the stars of the show. However they do complement the show superbly, and their harmony singing and dancing is just about as close to Take That's originals as anyone is ever going to get. Instead, the story is about a group of five teenage schoolgirl fans. We see them as both their young selves but mostly as their forty-something personas. The protagonist is Rachel (Rachel Lumberg) who, after having lost contact with her friends after high school has fallen into a mundane marriage and living in the same one-horse town that she grew up in, decides, and on a whim to enter a radio competition to win tickets to see Take That live in concert in Prague. Of course, she wins; and in a mid-life crisis sort of way decides to reconnect with her school friends and go to Prague with them. The story is mostly light-hearted although the more sobering and tragic moments do hit, and hit hard. But mostly this is a life-affirming, feel-good Musical, which makes you want to go out in the street and hug everyone you meet! Lumberg and her younger alter-ego Faye Christall are superb. In fact, the whole ensemble is perfectly cast. It is difficult to single any single performer out since they all seemed just perfect. I even liked the idea of using just one man, Andy Williams, to play all the tiny cameos. A nice idea that worked well. I think one of the main reasons this show worked, and worked so well, is that the story tells of real people. We see five aspiring teenage girls with dreams of what their future holds. We've all been there, we've all said those things or similar; yet how few of us actually get to realise our ambitions. So when we see them as adults; disappointed with their lot, changed with unfulfilled promises and having settled for the mediocre, we can immediately relate to them in a way perhaps we couldn't have done had they all have been successful and were all tall, slim, pretty, glamorous Musical Theatre actresses! The set is a two-tier, video-screened, big budget Concert Stage, which is the perfect backdrop for all the scenes which run seamlessly and smoothly. The show is slick and fast-paced; but the moments of reflection are superbly timed. Only to be backed with a huge upbeat production number with lights and smoke and even a fabulous aeroplane sequence. Created and written by Tim Firth, himself a northerner, the show creates a perfect balance between a human true-to-life story, and a pop concert in a way - to my knowledge - no other show does. Not even Mamma Mia comes close! I went thinking I would hate it (I have never been a Take That fan), but came out having enjoyed the show immensely and now white balloons will always have a special significance for me.